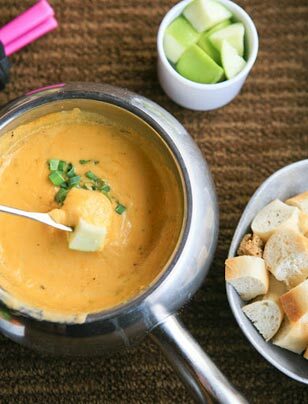 The Melting Pot Celebrates National Cheese Fondue Day! It’s the cheesiest day in America! King of Prussia’s popular restaurant, The Melting Pot, is celebrating National Cheese Fondue Day with the opportunity to enjoy free fondue for two! If you love fondue, this yummy opportunity is most certainly for you! The Melting Pot in King of Prussia is celebrating National Cheese Fondue Day, which falls on Wednesday, April 11, 2012, in a very delicious way. Enjoy free fondue for two starting Monday, April 9, 2012 through Thursday, April 12, 2012. Each night, only 20 reservations for a table for two can be accepted, so they expect to be sold out in the next few days. Please note online reservations cannot be taken for this special promotion. So to make a reservation kindly call The Melting Pot in King of Prussia at: 610-265-7195 and be sure to tell the host or manager that you are making a reservation for two SPECIFICALLY for National Cheese Fondue Day! Receive a small cheese fondue (serves two individuals). Limit one small cheese fondue per couple. Cheese fondue selection may vary and the offer is only valid between Monday, April 9, 2012 and Thursday, April 12, 2012. Last but not least, this offer cannot be combined with any other offer or discount. And, reservations are subject to availability. And, do not forget Main Line Restaurant Week fans! The Melting Pot is a brand new participant this Spring as part of our King of Prussia ‘Sensational Six’ restaurants. The Melting Pot is offering an outstanding value of a 3-course dinner menu of $30 for Main Line Restaurant Week. Make your reservations with The Melting Pot for Spring Main Line Restaurant Week by clicking here! The Melting Pot is located at 150 Allendale Road Suite 2100 in King of Prussia, PA. To make reservations for Main Line Restaurant Week call 610-265-7195 or click here to make a reservation via OpenTable. « Buzz: The Pub at Wegmans’ Free Veggie Burger Giveaway!